ZENER DIODES posses numerous applications in transistor circuitary. 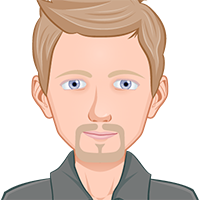 Here we are going to discuss some important points in Zener diode applications. Zener diode is popularly used as Shunt Regulator or Voltage Regulator. Voltage regulation is a measure of circuit's ability to maintain constant output voltage even when either input voltage or load current varies. Figure shows a Zener diode is connected as voltage regulator. 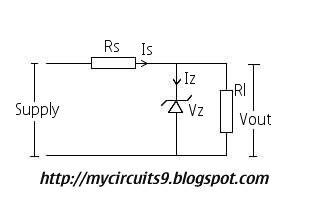 It may provide a constant voltage from a Source whose voltage may vary appreciably. 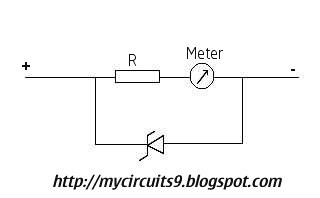 A current limiting resistor Rs is connected serial to Zener diode, it is necessary in the circuit to limit the current in safe value. The voltage source Vs and resistor Rs is so selected such that the Zener diode operates in breakdown region. The diode voltage in this region, which is also the voltage across the load Rl is called Zener voltage, Vz and the diode current is called Zener current, Iz. The series resistor Rs absorbs the output voltage fluctuations so as to maintain voltage across the load constant. Zener diode is reverse connected to the input voltage whose variations are to be regulated. 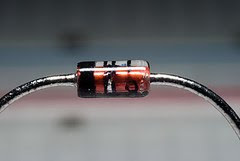 Zener diode may also find its applications in meter protection. The Figure shows how a Zener diode protect meters from excess voltage that is applied accidently. In this case Zener diode is connected parallel to meter. In case of accidental overload, most of the current will pass through the Zener diode and so the meter movement will be saved from damage. 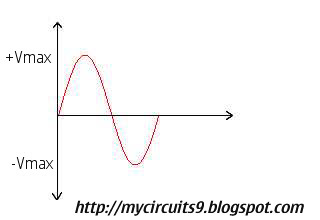 Zener diodes can be used to clip off the peak value of input wave form. 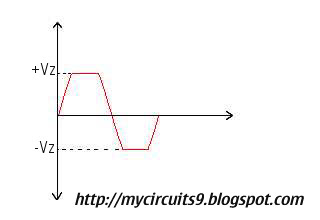 Figure shows the circuit diagram for Zener as peak Clipper. 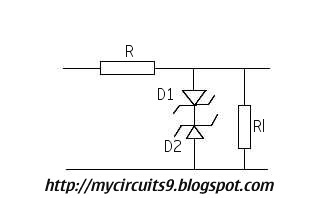 For positive input half cycle diode D1 is Forward biased and acts like a short while diode D2 acts like an open upto Vz. Therefore diode D2 goes into breakdown and holds the output voltage constant at Vz till input voltage falls below Vz in the latter part of positive half cycle. Zener diode can produce a sudden change from Low current to High current, so it is useful for switching applications. It is quite fast in switching operations.